It’s great you’ve dropped by and we hope you find what you’re looking for. The links at the top of the page will cover the main things we do and you can also find out what we’re up to via Facebook. This week we have a few fantastic events coming up. 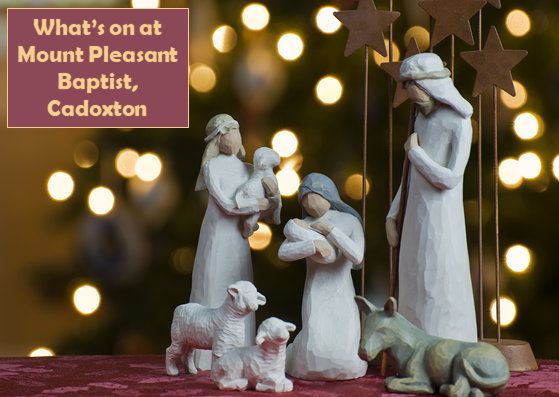 First, on Sunday at 10:30am there's the Church Nativity service and Carols by Candlelight at 6pm the same day (23 December). Then on Christmas Day we're having a short service at 10.30am. Come along to celebrate Christmas and open a present with everyone else! We are looking forward to returning to Wales for a conference entitled Going Beyond the Normal: mission in the 21st century. This will take place from 3 – 7pm on Saturday 11 May at Bethesda Chapel, Fairoaks, Dinas Powys, CF64 4QU. This event is free to attend and a meal will be provided with an opportunity to give a donation on the day. Is Christianity a matter of Faith and Facts ? Is Christianity a matter of Faith and Facts? A question and answer session. If you have any other queries regarding this event or us as a group please contact us on the number below. We also wish to thank the Tabernacle Church for hosting us. This Christian Apologetics group is interdenominational with multiple fellowships being represented on the committee. Churches across Wales will be involved in Mission from Wednesday 26th June to Sunday 30th June. Churches and hubs are then invited to put on a special event on Sunday 1 july to invite people who have responded too! This works in tandem with other Follow up and dsicplsehip methods, like a one – one coffee and Alpha. We are very excited about continuing the Mission to Wales through 2019. Wednesday 27th to Satuday 30th June - 10:30am to 2pm! Join us!